We're seeing complaints from users with 32-bit versions of Office 2010, plus Outlook 2007, and Outlook 2003 installed on Windows 10 that hyperlinks in email won't open after they've set Internet Explorer as the default browser. The user will see a dialog that asks what program you want to use to open the link. Clicking the Always use this app box does not save the changes - the next time you click a link, the dialog comes up again. Some users will see the Locate Link Browser window, while one Outlook 2003 user reported that Internet Explorer opened to the site's home page. Only Internet Explorer has a problem opening links, they work fine in Edge or Chrome, just not in Internet Explorer. Links containing an & should open properly in new tabs using the command line above. The original CMD version offered by Microsoft did not work with & signs in the URL. The registry file was updated with the new command line. Double click on the link to run it. If it opens as a text file in a new browser window, you'll need to right click on the link and choose 'Save target as' (or 'Save link as' in Chrome). You may need to change the file extension from txt to reg then double click to run it. "Open All Hyperlinks in an Outlook Email Message"
I use Chrome and have it set as my default everything yet each time a restart is done I get the "How to you want to open" thing on my desktop after the initial log in without opening anything at all. I suggest that a better title for this article would be "Outlook hyperlinks - prompts to specify browser every time"
To simplify all this, keep in mind that this is almost always a browser problem in that the Office app has to fire up a browser to follow the link and does not know which one. Essentially, that's it. Fooling around with browser default settings can clobber a line in the Registry. Go to Settings and set the default browser to IE. Try the ctrl-click on a link. If it works, reset the default browser to another browser and try again. This is the easiest check and should be done first before getting crazy with reloads, uninstalls, and Registry editing. If it doesn't work, go crazy! It depends on the cause. For the scenario on this page, changing the browser to IE does not work. 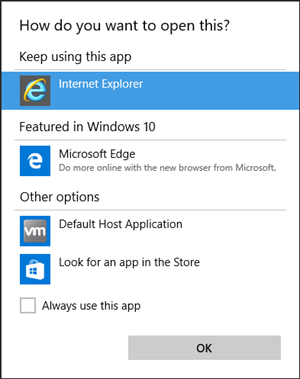 You need to use one of the registry fixes or use Edge. So this happened to a few computers on my network but i don't have the "opennew" folder in my registry. Any idea why or a work around? If a registry key (folder) or value doesn't exist, create it. But... it seems odd that that key doesn't exist. I have tried manual change and sub-routine change and still receiving same message on all hyperlink opening attempts. I am running Windows 10 & IE10 although had been running Firefox (reinstallation is what I believe caused my problem originally) and Google Chrome. I have since uninstalled both just trying to get IE to work properly. Can Microsoft's pushing for the use of Edge be a possible culprit here? Are you using Outlook 2010 and older? Only those Outlook versions are affected by this. Microsoft made a change to the OS that caused it - I'm not sure if the change gets blamed on Edge or not. I'm using Edge and it is not working? Your fix is absolutely perfect! In my case, M.Outlook 2003 SP3 with Windows 10 64bits. Is your problem and error message the same as on this page? Did you restart outlook after running the reg file?